Inspired by lessons the coaches learned from rugby and working in concert with the Seahawks, UW began implementing a new technique that takes the head out of the tackle. He led with his head. That’s what Pete Kwiatkowski remembers about the one concussion he is certain he had during his All-America career as a linebacker for Boise State in the 1980s. He remembers a tight end catching the ball and he remembers ramming his facemask into the tight end’s hip. Back then, the head injury that had “stars” flashing in Kwiatkowski’s eyes wasn’t diagnosed as a concussion. “We called them headaches,” he said. Back then, the tackling form that Kwiatkowski used on the tight end was a common one — one that had a tackler put his helmet across (or directly into) a ballcarrier’s chest, making the head a fundamental component of the most fundamental play in football. That’s how Kwiatkowski and generations of players learned to tackle and that, in turn, is how he taught players to tackle in his first 25 years as a coach. Now in his second season as Washington’s defensive coordinator, Kwiatkowski is still using his head — only now he is using it in a way that he is convinced is smarter and safer for his players. 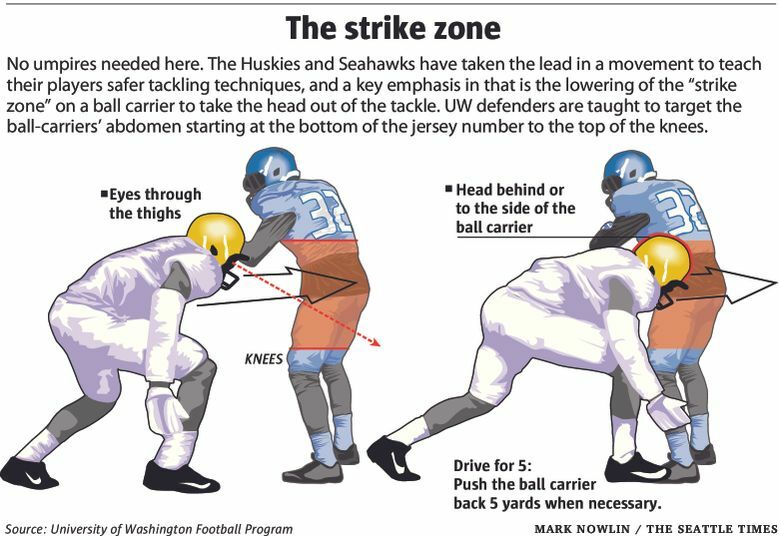 Last year, Kwiatkowski and the UW coaching staff, inspired by lessons they learned from rugby and working in concert with the Seahawks, began implementing a new technique that takes the head out of the tackle. 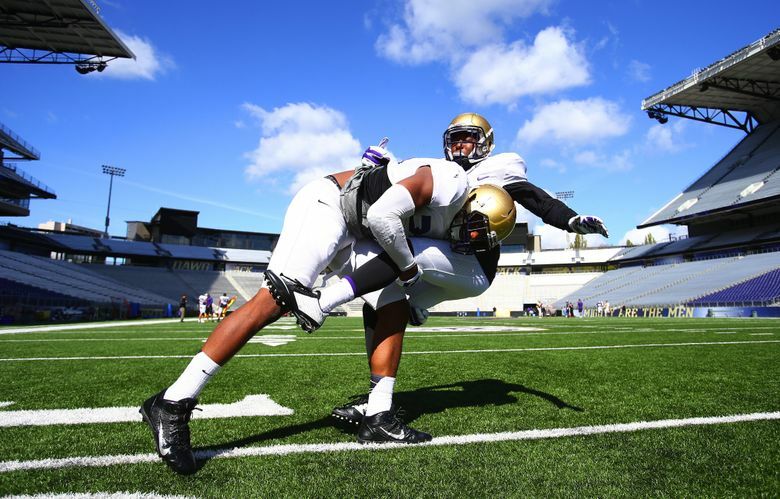 It is not a stretch to say Seattle has become the epicenter for safer tackling: Seahawks coach Pete Carroll has championed the cause, and UW coach Chris Petersen is committed to help these methods ripple down to the high-school and youth-football ranks. Their goal: to change the tackle and, they hope, the game for good. Football is at a crossroads. The public’s awareness of head injuries has never been greater. On Wednesday, a federal judge approved a settlement to resolve a concussion lawsuit brought against the NFL by more than 5,000 former players, an agreement that could cost the league $900 million or more. Last month, San Francisco 49ers linebacker Chris Borland, who had 108 tackles as a rookie last season, announced his retirement, at age 24, citing concerns about the long-term effects of head injuries. In November 2013, ESPN reported that participation in Pop Warner youth football had declined 9.5 percent from 2010-12, the largest two-year decline in the organization’s history. Pop Warner’s chief medical officer cited head injuries as the “No. 1 cause” in the decline. Petersen isn’t naïve to the sport’s crisis. The idea of improving the tackling technique first struck Petersen some five years ago when he was talking with a former player of his at Boise State. The player, a fullback named Michael Lose, after finishing his career with the Broncos had starting playing for the local rugby team. The topic of injuries came up, and Petersen was surprised to hear about the relatively rare cases of concussions among rugby players, who don’t wear helmets. “That really piqued our interest,” Petersen said. Still, Petersen and his staff didn’t completely embrace the rugby style until last year, after taking over at UW. Petersen stumbled on the topic during a conversation with Rocky Seto, a Seahawks defensive coach. They wound up talking tackling for an hour. The Seahawks had already worked through many of the finer points of the new techniques that the UW coaches had been toying with. For Petersen, the conversation offered validation and motivation. The video, “Hawk Tackling,” released last July, is a 21-minute tutorial on how the Seahawks teach and drill tackling. The emphasis for a tackler is to use his shoulder, not his head, while lowering where he targets his hits on a ballcarrier. The Huskies, with Seto’s collaboration, incorporated some of the Seahawks’ specific techniques into their own principles and began teaching UW players. During regular tackling circuits at practice, Kwiatkowski can now be heard barking “eyes through the thighs” at players, watching closely to make sure the tackler’s head is placed to the side (or behind) the ballcarrier. The Huskies have had UW’s club rugby team — which won a national championship last year, with UW linebacker Psalm Wooching playing both sports — out to practice to reinforce the rugby methods. Earlier this month, Seto again stopped by the UW football facility to check on the Huskies’ progress. Petersen hopes the trend continues to spread and, more important, trickles down to youth coaches. He’s trying to get the word out himself. On three occasions over the past three months, he spoke about the new tackling techniques at coaching clinics: at Las Vegas in February; at Nike’s Oregon headquarters in March; and earlier this month, before some 200 high-school coaches at UW’s popular clinic, he made the topic the centerpiece of his keynote address. Like UW’s coaches were, some high-school coaches have expressed initial skepticism. Dave Miller, a veteran coach at Lakes High in Lakewood, implemented the rugby tackling techniques with his team last year after watching the Seahawks’ video. Miller assumed there would be a spike in shoulder injuries on his team, but he was pleasantly surprised when that wasn’t the case. After only one season using the new technique, it is too early for Petersen to say definitively that the changes resulted in fewer concussions for the Huskies. Seto, however, said concussions have been reduced “drastically” for the Seahawks because of their shoulder tackling the past few years, and particularly so among defensive players. The NFL, Seto said, doesn’t allow teams to disclose specific concussion data, but The Associated Press reported in January that concussion league-wide fell 25 percent during the 2014 season (111 total concussions, down from 148 in 2013). Petersen feels a groundswell coming.